As a part of the subscription model with Pro Tools, Avid releases regular tweaks, updates and add-ons to the software over the length of your subscription. Just as we were starting to think the company had given us the last update for 2018, we were gifted a surprise, just in time for Christmas. Avid has partnered with software-instrument developer UVI to provide the company’s Falcon hybrid virtual instrument and an exclusive sound library to all Pro Tools and Pro Tools | Ultimate users. Pro Tools | First users don’t entirely miss out with their entry-level option. They get access to the 2.6GB Plugsound Avid Edition sound library through the free UVI Workstation 3 plug-in, so not bad at all. 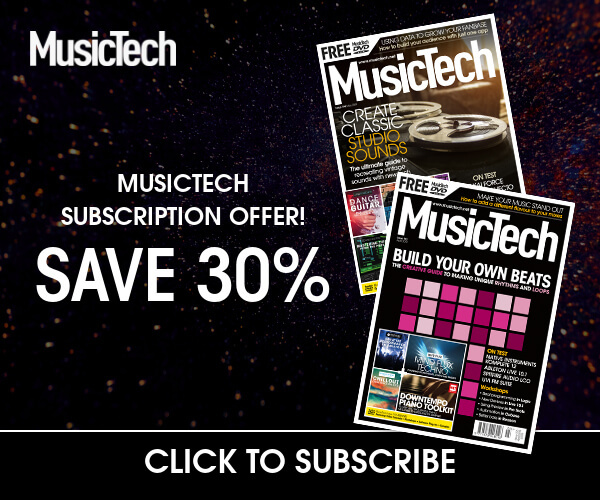 MusicTech looked at UVI’s Falcon instrument in spring 2017, giving it 9/10 and our Choice award, commenting that: “Falcon is a sonic powerhouse.” And with the additional benefit of the Plugsound Avid Edition sound library – bringing the combined value of software being given away free here to just short of $500 – Pro Tools users really are in for a New Year treat. To continue with this workshop, readers will need to download and install the Falcon AAX plug-in from their Avid accounts using the Avid Application Manager, and then further download the Falcon Factory library and Plugsound Avid Edition library. 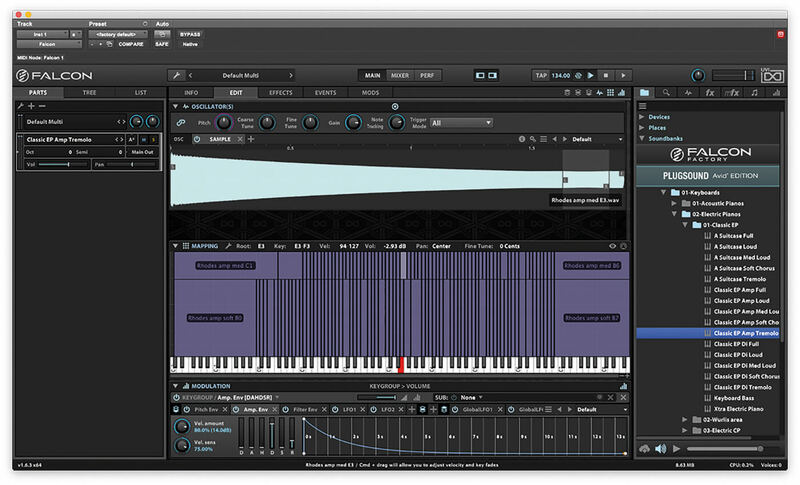 Falcon is a hybrid instrument, combining various forms of synthesis and sampling into a single plug-in. 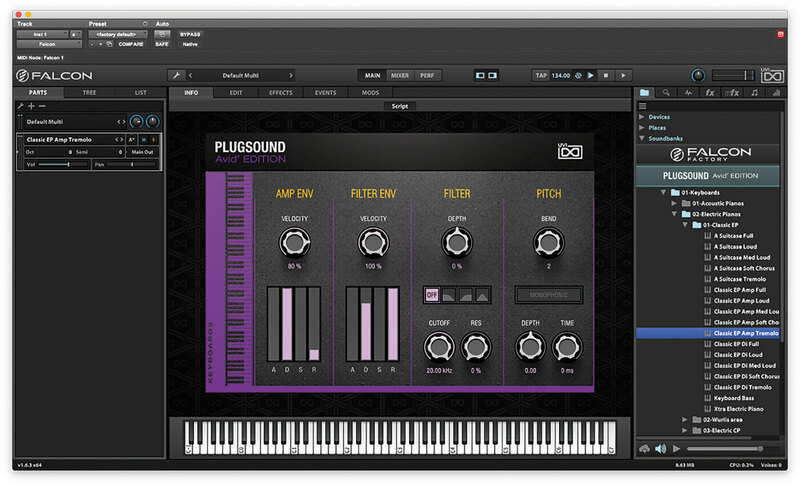 The bundled Plugsound Avid Edition library includes a huge sonic palette to get you started, which is split into five broad categories: Keyboards, Fretted, Drums and Percs, Synths, and Orchestral. The Falcon Factory library is more focused towards synthetic sounds, with an enormous selection covering modern and vintage sounds. While it’s entirely possible to use Falcon without ever reaching into the murky depths of sound design, once you do so, the possibilities – even for simply editing remade patches – opens up like an enormous sonic vista in front of you. 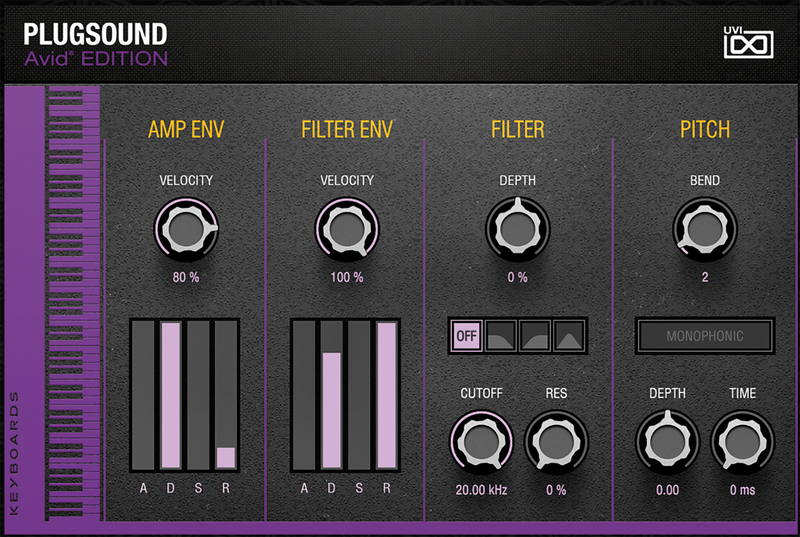 Sounds in Falcon are built up from Oscillator modules. 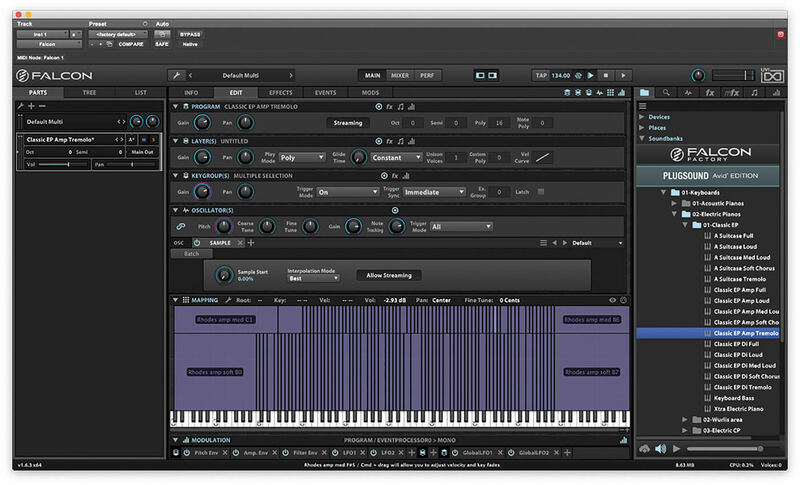 Within the software, there are eight of these synthesis modules, including classic analogue-style oscillators, wavetable and FM oscillators, the additive Organ oscillator, and the advanced physical-modelling Pluck oscillator. 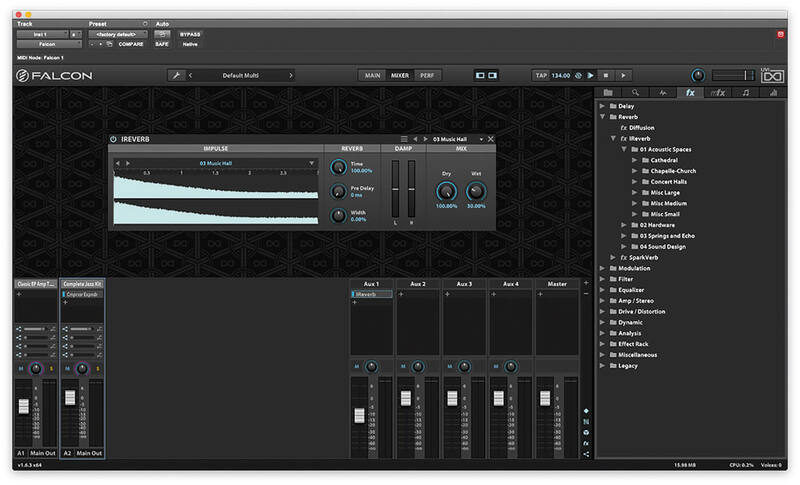 In addition to these modules, Falcon also has seven sampling-based oscillators, ranging from traditional sampling and beat slicing to four granular-inspired samplers using custom IRCAM algorithms. Comprehensive modulation options transform the sounds coming from these Oscillator modules, with a variety of envelope and LFOs. But things start to get really interesting once you look at the extent of the effects options built into Falcon, each of which can be further modulated and sequenced to create moving, evolving textures. There are over 80 effects built-into Falcon, which can be used either in series, or in parallel on an aux buss in the mixer section. While multiple oscillators can be combined into a single instrument, called a ‘Part’ in Falcon, it is also possible to combine multiple Parts into a single ‘Multi’, which you can then control and mix, creating an entire song inside of Falcon, if you wish, without ever really using Pro Tools for anything but hosting. However, to take things even further still, you can route each Part from a Multi to its own dedicated output in the mixer, which can then be routed to aux busses, or audio channels in Pro Tools ready for further processing – all from a single instance of the plug-in. Finally, if you combine this with Track Presets in Pro Tools, then you could create some very powerful and yet easy-to-use songwriting templates, with all the instruments you need in a single instance of Falcon. Some might baulk at the price of a subscription to Pro Tools, but if Avid keeps working with plug-in developers like this, those prices are starting to look more attractive all the time. 1. In our first step, let’s create a new session in Pro Tools, adding a single Instrument channel. Then we simply add a single instance of Falcon to that channel. Next, let’s take a look inside. 2. Falcon opens with an empty patch. 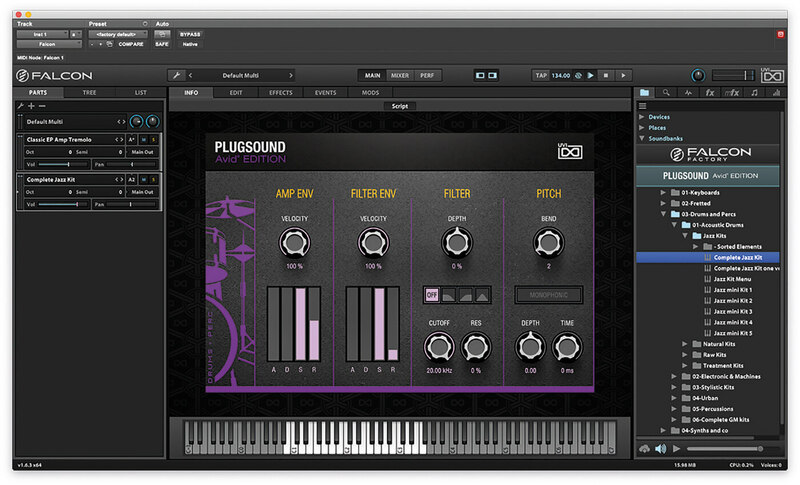 Add an Electric Piano from the PlugSound Avid Edition library. 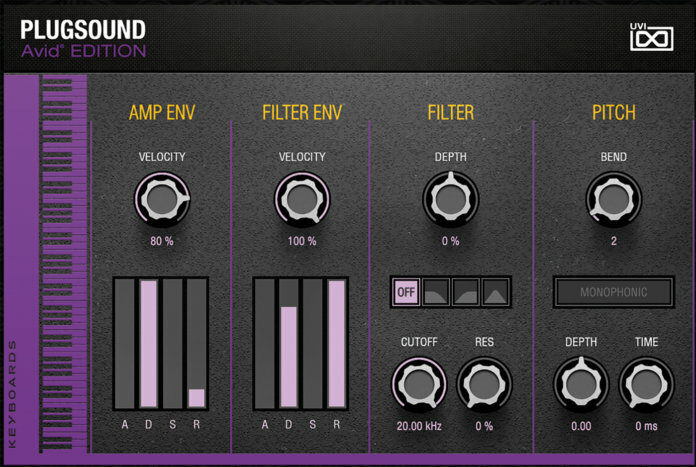 Open the Avid Edition sound bank and select 01-Keyboards>02-Electric Pianos>01-Classic EP>Classic EP Amp Tremolo. 3. 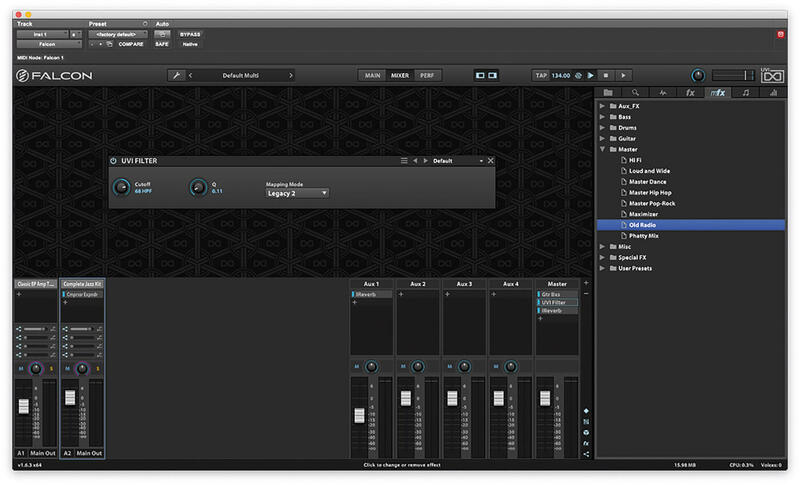 The interface adapts to the patch that has been loaded, using a script written by the sound designer. This brings the most important parameters up ready to be played, like the amp and filter. 4. While in many cases this might be enough, let’s take a look at what’s happening under the hood. Click the Edit button to see the source of the sound. This can be quite confusing, as there’s a lot going on. 5. 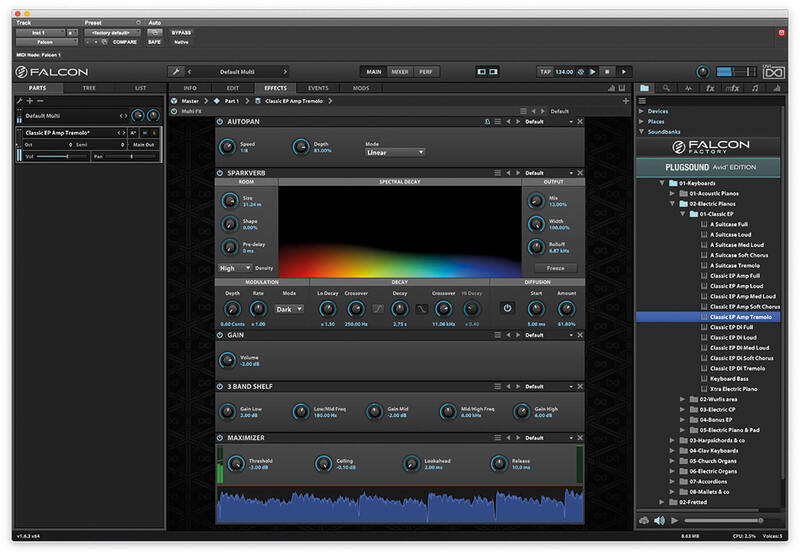 We can simplify the Edit window by hiding the Program, Layer and Keygroups using the buttons on the top right, leaving only the oscillators – in this case a simple Sample Oscillator, Mapping Editor and Modulation. 6. The Mapping Editor shows which samples are played, with some notes triggering unique samples, while others are copied across groups of notes and pitch-shifted. There is also a velocity layer set up. 7. At the bottom of the Edit window is the Modulation area. While some of these parameters are available from the main Info screen, you can go into greater detail here, adjusting not only the ADSR, but a Delay and Hold, too (DAHDSR). 8. The effects are a combination of Autopan, which is providing much of the tremolo effect; Sparkverb, a reverb effect, which gives the sound some depth and realism; and also a basic three-band EQ and a simple-to-use limiter. 9. There are over 80 other effects to choose from, and we can add more by clicking on the ‘+’ symbol near the top right of the Effects screen. 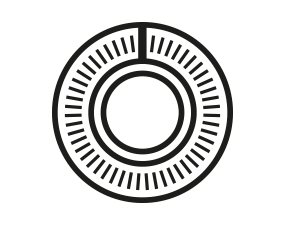 Try adding a little delay to the Electric Piano sound using the Analog Tape Delay effect. 10. New effects get added to the end of the chain, but we can reposition them by clicking on the bar to the right of the effect name, and dragging the effect up or down. Effects are processed from top to bottom. 11. 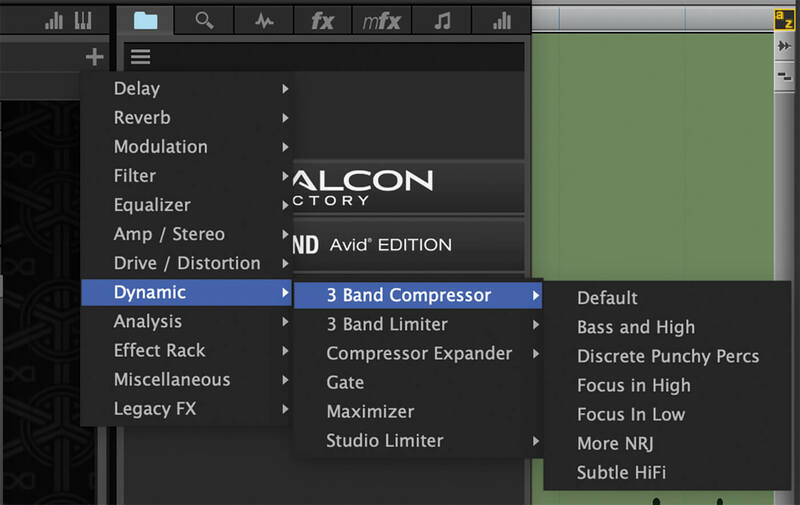 Each effect has its own bank of presets, loaded directly from the FX list, or by clicking on the preset-menu tool. Here, we’re loading the 1-8 Tape preset into the Analog Tape Delay module, to add some 1/8th note delays. 12. Falcon can load more than one part at a time. Let’s add some jazz drums to the piano from 03-Drums and Percs>Jazz Kits>Complete Jazz Kit. Do not double-click the Jazz Kit patch, or it will load over the existing Electric-Piano patch. 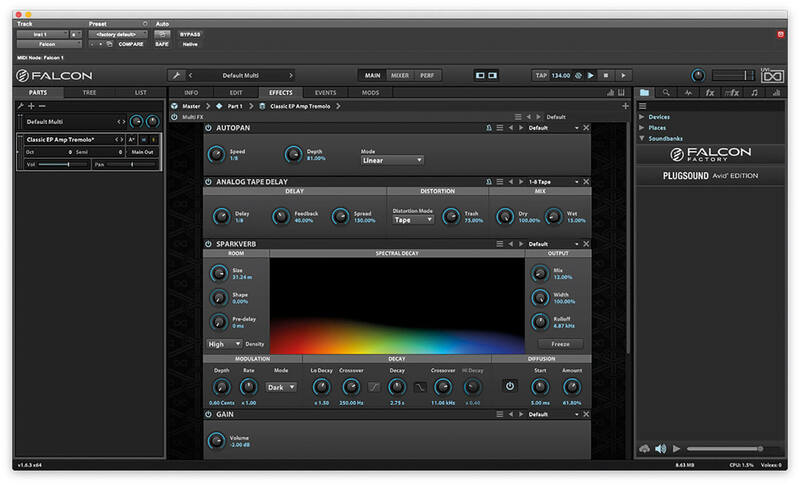 UVI ALSO DOES EFFECTS While we’re on the subject of UVI titles, we should also mention the company’s effects, in particular Relayer and Rotary, which are a delay and organ-effect simulator respectively. These are sleek-looking plug-ins and almost act like instruments in their own right. 13. In the Parts list, ensure that the Electric Piano is assigned to MIDI channel A1 and the drum kit to A2. 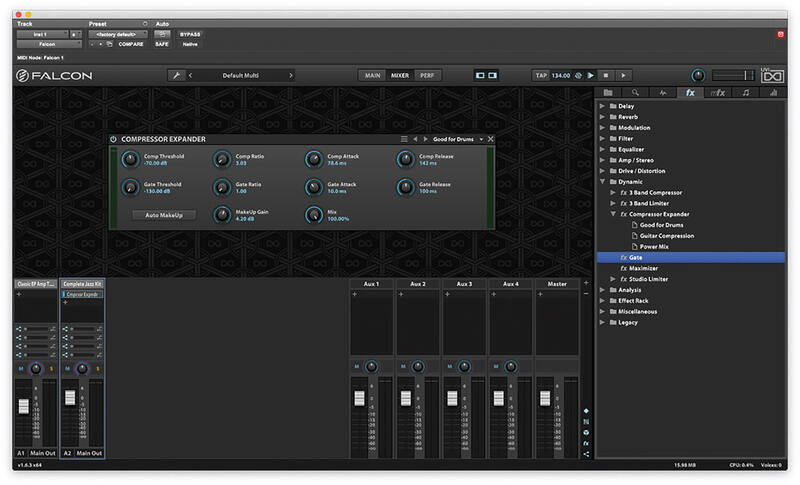 This will enable you to control each Part from a different MIDI channel, rather than simply using each part in unison. 14. Create a new MIDI channel in Pro Tools and assign the output of the channel to Inst 1 (or whatever you named your instrument channel)>Falcon 1>Channel-2. This MIDI channel will now control the drum kit. 15. The Mixer page in Falcon enables us to mix the various Parts coming from Falcon into the stereo signal coming from the instrument channel. You can add additional effects to each Part here by pressing the ‘+’ button. 16. You can assign effects to aux channels to be used in parallel with the direct signal. There are four sends on the mixer channel for each Part, which need to be dialled up before the aux channel will receive anything. 17. 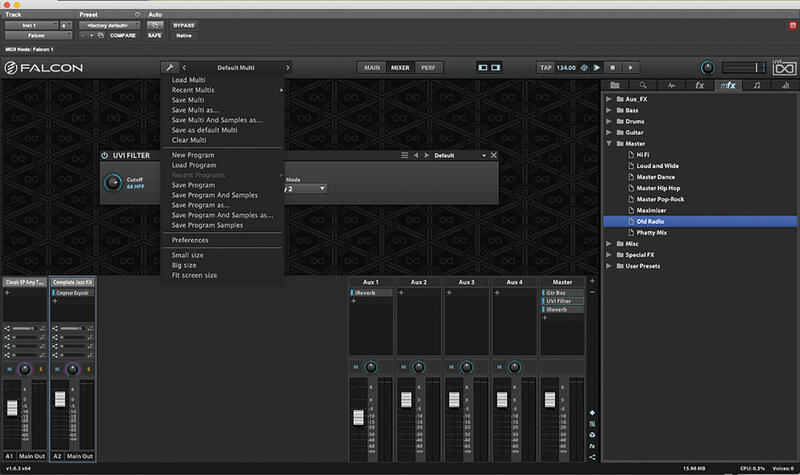 In addition to individual effects, the FX browser page on the right lets you load multiple effects onto a channel or buss. Try dragging the Master> Old Radio preset onto the master channel. This will add three effects at once. 18. Once you have added all the Parts and effects you want for your sound you can save this as a Multi, ready to be loaded into any future projects. Simply click on the Spanner/Wrench icon and select Save Multi As.